Just in time for Father's Day, check out Dads at a Distance for some great ideas on how your kids can interact with their Dads even if they are deployed. This site has been created to help dads maintain and strengthen the relationships they have with their children while they are away. 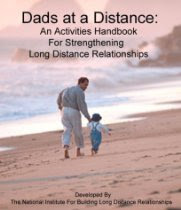 Click here to view 20 Long Distance Activities for Dads at a Distance. If you know kid(s) who have a mother that is deployed, then check out Moms over Miles .